Rolf Lüders, Minister for Finance and Economy in 1982-3 under Pinochet’s military dictatorship in Chile, is a leading economist and academic at the Pontificia Universidad Católica de Chile, and as it happens, one of my lecturers during my year abroad in Santiago. Lüders graduated from the University of Chicago with a Master’s degree in 1960, where he was taught by economic luminaries Arnold Harberger and Milton Friedman. Friedman is of course the infamous father of monetarism who influenced the likes of Ronald Reagan and Margaret Thatcher. In the 1970s, Lüders became part of the Chicago Boys, a group of neoliberal economists who played a pivotal role in developing Pinochet’s reforms with the aim of modernising the economy, leading to the so-called “miracle of Chile’. Nowadays, you’ll find Lüders working on publications, such as his recent collaborative 780-page book entitled The Republic in Figures, as well as passing on his expertise in modules like ‘Economic Analysis and Chilean Experience’, which I fortuitously chose to take this semester. When I approached him for this interview, he was pleasantly enthusiastic to provide an insight into his economic background and his interpretation of current economic issues. SG: How did Friedman and Harberger influence you during your studies in Chicago? RL: The economics I learned during my formal studies stem from the University of Chicago. On the one hand, in those years, the late 1950’s and early 1960’s, Milton Friedman was the undisputed leader of its economics department and his academic points of view dominated it. On the other hand, Harberger was the de facto head of the programme under whose auspices we were studying in Chicago. As such, he had close contact with us and given his unique approach to economics, his intellectual influence on us -the Latin American students in Chicago- is undeniable. So much so, that he is considered the father of the Chicago Boys. Finally, on a personal level, both Friedman and Harberger- together with Robert Fogel, who also received a Nobel Prize- were my Ph.D. thesis advisors. SG: Do you think Friedman’s monetarist ideas are still relevant today? RL: The answer is yes and no. Yes, if you define monetarism as the doctrine which relates changes in the money supply to changes in nominal GDP, that is, to output changes in the short-run and price changes in the long-run. No, if you define it narrowly as the doctrine which advocates (government) control over the money supply to achieve price stability and smooth output growth. Today monetary policy emphasises instead expectation management and interest rate manipulation as its preferred instruments. In any case, there is no doubt that -as Friedman argued- inflation is always a monetary phenomenon. SG: What was it like to be part of the Chicago Boys? Why did they become so important? RL: Nothing special. In the 1950’s, under the auspices of USAID, the United States’ official aid agency, our university, the Pontificia Universidad Católica de Chile (PUC), entered an agreement with the University of Chicago (UofC) to establish an Economic Research Centre at PUC and to provide graduate training in economics in Chicago to about 25 Chileans. To staff the Centre, which today is our Institute of Economics, initially four UofC professors were hired, who were replaced by Chileans once these latter finished their graduate studies. Around 1973, the year of the military coup, about 10 Chilean UofC graduates were working full-time at the Centre and their accumulated knowledge on the Chilean economy was already very significant. Once in power, the military did not want to continue with the type of protectionist and interventionist economic policies which had prevailed in Chile since the 1930’s and therefore turned to the PUC economists, who had a more liberal approach. Initially these UofC economists who joined the military government were called Chicago Boys. Later, this nickname was also applied to other Chilean liberal economists. SG: What role did Pinochet’s economic policies and the “miracle of Chile” play in shaping the Chile of today? RL: The role of the Chicago Boys was absolutely crucial in the modernisation of the country, including the adoption of pro-economic growth policies after the Allende government. Already in 1955, the Chilean government had hired a group of foreign consultants (the Klein-Saks Mission) to advise it on measures to reduce the already then extremely high inflation rate (80 percent). They concluded that a permanent reduction of inflation would require a major structural transformation of the economy, which -it turned out- was at the time not politically feasible. Twenty years later, while economic conditions in the country continued to deteriorate and while inflation was running at several hundred per cents a year, the military put the Chicago Boys in charge of economic policy. Their programme (El Ladrillo) of radical and liberal structural reform represented a significant deepening of the Klein-Saks Mission’s proposals, but this time they could be implemented with the support of the regime in power. As a result of these structural reforms, coupled with a very successful political transition, between 1985 and 1995, economic growth accelerated to about seven per cent per year while the inflation reduced to about three per cent per year, the Central Bank’s target. This is the time when some people, especially abroad, began to talk about the Chilean Miracle. SG: In an interview with Radio Duna, you explained that the structure of Chile’s economic growth has been like that of a developed country, yet Chile is not developed. Why is this a problem? RL: In high-income countries, services account for between 75 and 80 per cent of GDP and are the natural result of the development process (from raw materials to manufacturing and finally to services). 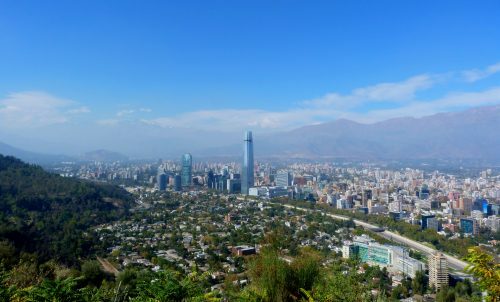 In Chile, which has a GDP per capita of about 40 per cent of that of developed countries, this percentage also exceeds 75 per cent, while one would expect it to be significantly lower. This is the result of the misguided economic policies of the past, which subsidised inefficient and capital-intensive manufacturing, and over-allocated labour into low productivity services, as well as policies that made it possible to over-expand government services using rents from the mining industry. SG: Do you think premature deindustrialisation is a threat to Chile’s economy? RL: Yes, in the sense that Chile has an over-expanded service sector. However, the wrong solution would be to start again, as the country did in the twentieth century, to directly protect- by means of import tariffs and other such instruments- tradable sectors (agriculture, manufacturing and non-copper mining). Probably the most important tool to reduce our relative production of services is to make sure that copper rents are not channelled into government services. SG: In your opinion, what are currently the biggest challenges for Chile? RL: To continue its development process Chile must regain the previously existing broad agreement regarding the country’s economic policy objectives. Chile is most likely suffering from the “middle income country syndrome”. That is, the majority of citizens feel that GDP is high enough to engage in ambitious income redistribution programmes, under the erroneous belief that the country will continue to grow at past rates. This is, unfortunately, not the case. Chile’s economic growth rates are now below those of the USA, never mind the rest of the World, and the country is deeply divided about its optimal policy objectives. Until a new agreement is reached, investment -and therefore economic growth- is likely to remain low. SG: Do you think that poverty is a problem in Chile? RL: There are many ways to measure poverty, but no matter which you consider appropriate, Chile has had an impressive record in reducing it. It is estimated that in 1850 about 95 percent of the country’s population was poor, while today this same measure -based on calorie and protein intake- is below 10 percent. Extreme poverty is below three per cent. A new measure, which takes education levels into account -among other socio-economic factors- estimates poverty rates of around 20 per cent. Since the mid 1970’s, socio-economic policies have been targeted to reduce poverty and eliminate extreme poverty, and this will continue to be the case. SG: Latin America is notoriously the most unequal continent on the planet. How do you think economic history has contributed to Chile’s distribution of income? RL: Chile is a natural resource rich country, especially in mining. In addition, in colonial times in Chile, land was allocated by the Spanish crown in very large lots to relatively few people. Mining countries, and countries in which land ownership is highly concentrated, tend to have more unequal income distributions than others. Moreover, up until the 1960’s, a vicious cycle allowed the rich to accumulate relatively more human capital than the rest of the population. This has changed considerably; in the last decade income distribution in Chile has rapidly become far less uneven, in basic terms this is because the younger generations tend to have similar levels of access to education and therefore human capital formation. As older generations fade, income distribution should converge towards OECD country standards within the next two decades. SG: Finally, do you think sustainable development has a part to play in Chile’s future? RL: Very definitely so. Protection of the environment has been an important concern in the last few decades. Investment projects of any significance must go through a rather strict- and unfortunately rather cumbersome- environmental protection process. So much so, that most of the latest mining and energy investments projects have been rejected. The country also has so-called “green” taxes, to discourage the use of a number of products which harm the environment. Of course, more can be done, but it should always be on a social cost-benefit basis.